When I started in public relations (public affairs), I spent my first week at the statehouse in Augusta, Maine. In this era before internet, the energy in the building was palpable, fueled in large part by an army of statehouse reporters. 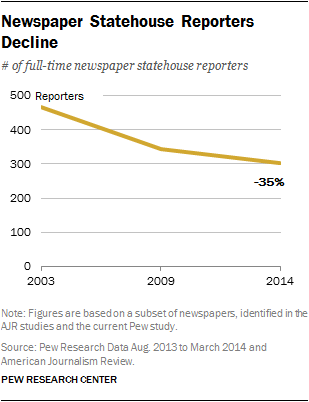 Since then, the bottom fell out: In 2014, the last time Pew published research on the topic, the number of statehouse reporters covering local government issues had dropped by 35 percent. If statehouse reporters are proxy for the health of local journalism, the patient isn’t well. This isn’t a screed on the decline of the media or its importance to the fabric of communities. There is fascinating qualitative and quantitative research on those topics, and you’d be wise to look up from Facebook, Instagram and YouTube to read it. No, what I’ll explore is the current state of “local journalism” and what that means for brand storytelling. Brands are part of the community fabric, but many companies fail to grasp the difference between the threads they can influence. A press release about a new product for K-12 educators has clear utility. Trade publications can use it to write news briefs for their readers. The press release is a blunt tool, however, and absent additional storytelling and context the story will dissolve into the ether, becoming nothing more than fodder for search engines to consume. Many educators, parents and administrators will never see – or care about – the story. Brand storytelling may include press releases but doesn’t rely on them. That’s an inside-out approach, as are many blogs and contributed content forms used so liberally today. The press release and so-called “thought leadership” pieces often lack context, empathy and honesty. A story without these things is one-dimensional, less trustworthy and rarely moves audiences to act. It’s missing the most important dimension – the perspective of the audience itself. At some point, communities started dismissing local journalism as too parochial, and support wavered. Local papers, even in larger cities such as Boston, slowly became less relevant. This is true in broadcast too, with stations vying for declining viewership. But all is not lost. A recent Poynter piece points to successes in places such as Mendocino County where a combination of new business models and community support/involvement is sustaining ongoing local journalism. The idea isn’t to build an ad-supported business to sell someday, but instead to build an asset for the community. “For-profit and nonprofit local online news organizations are the fastest-growing and most promising part of an emerging local news ecosystem that will also include public radio, citizen journalism, local TV, niche single-subject publications, re-imagined online alt-weeklies, journalism pursued by activist organizations and think tanks, library information projects, student media, and what’s left of traditional newspapers. Replacing and exceeding lost local journalism will take more than new models, recommitted and reimagined outlets and community support. The business community can and must contribute to local storytelling that doesn’t just “measurably perform” but instead strengthens the fabric. It won’t be easy and it’s not how modern marketers are trained, but it’s worth the investment to revive a local institution – and craft – that is critical to democracy, civility and trust. Much of the discussion around local journalism centers on its coverage of politics and policy, but there’s more to storytelling in the commons than civic awareness and political accountability. Good business storytelling, particularly around innovation, is increasing concentrated, albeit coming from great outlets such as Wired. And this makes it less accessible to the mainstream. We accept that we should think globally and act locally, but wouldn’t it be nice to live that ideal guided by local stories and local storytellers? Businesses can and should play active roles in community storytelling, as should their employees and partners. If local journalism is to replace what it lost, it must be fueled by real, honest and timely storytelling that connects deeply with the communities it serves, and some of that inspiration must come from business storytellers. Brands are part of communities too, but they mustn’t see their role as merely an extension of marketing. Brand storytelling must be different. The takeaways from the list above are many, but certain words and phrases stand out: unique, visually oriented, experimenting, engagement, diversity of content. Not coincidentally, these are expectations our agency has for business storytelling in 2019. The next logical step is to align brand storytelling, which we believe is best done with brand journalism, with local journalism. While other brands are zigging toward more “analytically-driven” content, you can zag into the local consciousness, doing your part to help journalism regain its footing. The Daily Dispatch and businesses in Henderson, North Carolina need one another. The same is true in communities where your business is located. You will certainly find ways to measure your performance online if you invest in local paid media, but you’ll also need to participate actively in stories from and about the community. How can get started with this? Look closely at your local market or markets to determine how media present news, opinions, ideas and stories. Look at both sponsored and unsponsored, traditional and digital, online and offline. Build relationships with local journalists, print, online and broadcast – take interest in what they’re trying to accomplish and in the seriousness of their craft. Align earned, owned and paid media using an “outside-in” view – thinking of serving the community not selling to it.